Indoff offers a wide selection of styles of extremely durable, Recycled Plastic Outdoor Furnishings that are constructed from 95% recycled materials creating a green solution that will out last traditional options. Recycled plastic lumber, unlike real wood, never requires sanding, refinishing or painting. Plastic planks will not crack, splinter, fade, mold or mildew and provide superior strength. Impervious to harsh weather conditions, these furnishings are guaranteed to provide many years of maintenance-free service. We offer a variety of styles with coordinating picnic tables, park benches and trash receptacles to create a complete outdoor setting. Planks are available in either natural cedar or majestic mahogany colors. 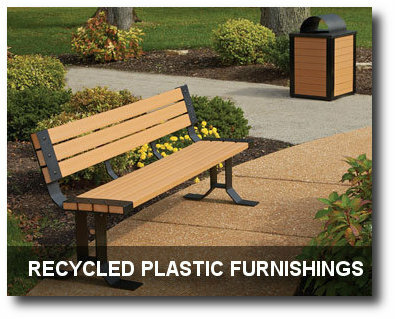 For the appearance of real wood without the upkeep associated with it - check out our selection of beautiful Recycled Plastic Lumber Furnishings available in our catalog. Click on the image to see all options. Call Allen Peterson at (844) 433-9610 for immediate assistance.